3 billion human lives ended on August 29th, 1997. The survivors of the war known as Judgment Day…They lived only to face a new nightmare. A jagged steel, metallic foot crushes a skull on the desolate, barren, hell beaten landscape of what was Los Angeles, the camera pans to reveal not one, but hundreds, thousands, even millions of jagged skulls being crushed by steel, metal, machine skeletons and a massive machine on four treads rolling through the desolate landscape, firing four plasma cannons while on the move. Thus was the opening of a classic Sci-Fi move, Terminator 2: Judgement Day, or T2 for short. Previously, the original movie, “The Terminator” was released in 1984 on very short budget of only 6 million. However, that movie became a blockbuster and shot both a little known director (then) by the name of James Cameron and of course, “AHHH-NNOOLLLDD” into fast track for stardom. Now, for the movies, several vehicles have been build. The most iconic of course is Cyberdyne System T-101 Model 800. Now, whether the “Hyperalloy” combat chassis without its camouflage covering, used as shock troops by Skynet, or the iconic “infiltration” unit that look suspiciously like a certain Austrian bodybuilder, the T-101 Armored Endoskeleton is one of the most iconic vehicles in Sci-Fi history. However, what is lesser known are the “HK’s” or Hunter-Killers. These includes the aerial one and the ground one with four treads. 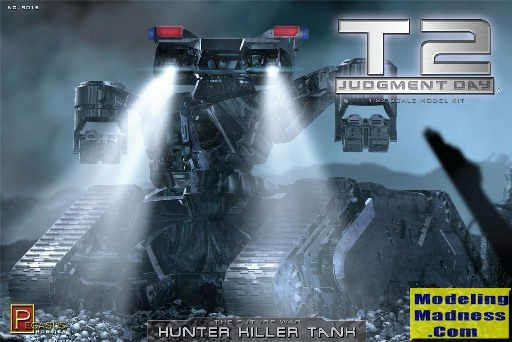 The subject of the model is the ground HK or Hunter Killer tank and is supposed to be based on the original studio model. George Oh had already previewed the aerial version of the HK at this link. This is the ground or the Hunter Killer tank and this one is in true 1/32 (Although I would’ve prefer it to 1/35. 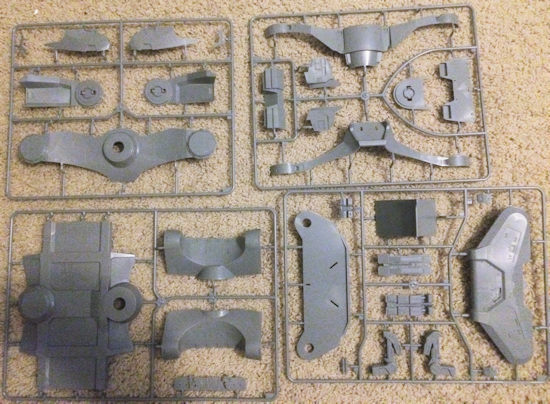 However, I understand the decision since Pegasus Hobbies had previous already released the 1/32 version of the Aerial Hunter Killer…That is not really in 1/32 BTW and a bunch of T-800 combat chassis in 1/32 scale also). Upon opening the rather large size box, one is greeted by a dozen or so sprues with four vinyl tracks. Now, the clear parts and the blue and red “police lights” are painted so it makes lighting up easy and Pegasus I believe do offer a separate lighting kit for $30. The pieces are not much and many are rather large since the HK tank is a rather large vehicle. A fold out, simple instruction page covering 11 simple stages are offered. Details generally are good, however, some details are simplified and make the model more toy like in appearance than anything else. For example, the running wheels, rather than separate to offer more detail, they are offered in one single piece that are also non-moving, which is a shame since if broken down, it can be quite detailed assembly that can move along with the drive wheels. Construction is ease of simplicity. Its obvious Pegasus have beginner modelers in mind here. Steps one and two cover the two front and rear drive sections while step 3 and 4 builds up the main hull. The lower hull is complete in section five. Recommend that you paint the model first before attaching the treads and put the drive sections into the lower hull. Also, notice the instructions carefully, carefully cementing and attaching the connector plate F2 will ensure the drive section can actually articulate. The rest of the steps covers the upper torso details. Step 6 begin with the four plasma cannons, two mounted on a rotating arm. Step 7 builds up the two folding and retracting arms. Although not shown in the films, but the HK tank do have two folding, retracting arms that can be used to pull interesting stuff off of the ground. When not in use, they fold up and become the tank’s frontal armor. Step 8 completes the head construction, notice the eyes, and the “police warning lights” are clear so you may have to save them for later. Step 9 completes the torso supporting structure. And finally, step 10 and 11 completes the torso and the tank. Well, that’s about all. It is simple and the parts are large and should make into an imposing vehicle when done. Should be a great kit for beginners and T2 fans alike!